Part of the DeltaStock family of brokers. DF Markets is a forex broker. 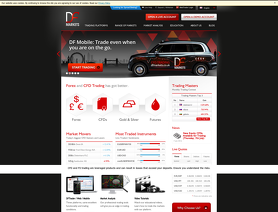 DF Markets offers the MetaTrader 4, MT Mobile, and WebTrader global forex trading top platforms. DFMarkets.co.uk offers over 70 of the most traded currency pairs, cfds, gold, silver, shares, indices, futures, and ETFs for your personal investment and trading options. Serious broker with responsible and fast customer service. Great are very very very low fees for trades.Many instruments to trade-forex pairs,commodities,indexes, stocks,futures,etfs. DF Markets will discontinue the MT4 support within Dec 31, 2014. DF will continue to provide operativity only by its own platfoms. Not so good for my trading habits requiring MT4.... Therefore I have to downgrade my rating for this Broker. 2012-01-28 4Star I opened a real account with DFMarkets one month ago, and so far good experience with them. Fast account activation, wire transfer deposit and welcome bonus credited within one day, very good spreads and order execution, their roll-over rates are fair and over the average of most brokers, 0.01 lots are tradable. No experience with withdrawals up to date. I’ve being trading with DFMarekts, I like it cause they have very low spreads. On the other hand, I didnt appreciate the long period I had to wait when I wanted to cash out my money. Nice broker, but I’ve traded with better. I've only tried the web based spreadbetting platform so far, and it seems good. The platform is a little slower to respond than some of the competition, and difficult to track results of individual closed trades, but overall a nice straightforward trading platform, good execution so far, and very helpful customer service. No bond markets on site, but forex, main indices, agricultural, metals and shares are there. Hi! I would like to say that I am very amazed about this broker. Their platform is professional and easy to manage. Spreads are pretty low and you can choose between fixed and variable. 40€ no deposit bonus in another great thing about this broker. I would really really recommend this broker to all people who want to make some real money. These guys are cool. I am so impressed with their customer service. Trade mainly indices and could not believe how good they are compared with the other broker I left in the UK. The platform is very easy to use and stable. Perhaps, THE BEST BROKER OF THE WORLD. British and regulated by FSA Broker, with spectacular double platform with not less spectacular orders execution; very low spreads, thausands of investment instruments, optimum leverage and stop out, and much more. The dream of the good Trader. deposit was instant through card, withdrawal took 2 business days. Tried DFMarekts for a few weeks, but that was enough for my decision to use another broker. High Stops Level on EURSUD (4 pips or better 40 because it is a 5digit broker). On other pairs even higher. Not that good execution times of mostly more than 1 second. Bad trading results, because of so many failures, during modifications of pending orders. While I tried DFMarkets I also tried another broker with the same EA at the same time. And the other broker made me nice profits, where DFMarketes produced loses. Although the latency to both brokers where as low as 20ms from my VPS. But the Stops Level of the other broker is "0" Pips. And the execution times of the other is far better and no failure messages during pending order modifications. Sorry but I can not recommend DFMarkets for traders.